As the country and Congress grapple with the sudden passing of Supreme Court Justice Antonin Scalia, a key lesson has emerged from his tenure and his legacy in civil rights cases in particular: A single Supreme Court justice can powerfully influence our national discourse on critical issues of inequality. Through the opinions they write, the language they employ in those opinions, the questions they ask, and the statements they make at argument and in interviews, Supreme Court justices can exercise leadership, affirming or challenging the dignity of those who are most marginalized. In selecting a nominee in the coming weeks, President Barack Obama may and should rightly consider a jurist who not only possesses a brilliant legal mind but who is also capable of asserting a persuasive and powerful voice that can lead us, once again, forward. The regrettable reality is that Scalia’s decisions and rhetoric often emboldened and legitimized a discourse about race and civil rights that questioned nearly every effort undertaken to ameliorate the effects of racial discrimination. From the Voting Rights Act, to minority set-asides, to affirmative action in higher education, Scalia’s voice led our conversation about race backward—over ground that had long been plowed and seeded—and helped halt the forward progression of our discourse. Along this journey backward, Scalia was largely motivated by two guiding lights: textualism, a theory that the literal language of statutes should come above all else in deciphering their meaning; and originalism, a philosophy suggesting that the framers’ view of the world should constrain how we interpret the Constitution today. These were bold and highly charged movements in their own right that Scalia did much to push into the mainstream. At times, Scalia marshaled this philosophy to vindicate the rights of criminal defendants, shaping the court’s jurisprudence about the right to confront witnesses and to have a jury make certain, critical determinations. But more often, his approach enshrined a regressive view of the law and the country, particularly when it came to constitutional protections for racial minorities, women and children, as well as in other criminal law contexts. Indeed, Scalia was famously unable to credibly square originalism with Brown v. Board of Education, and thus often conspicuously avoided the question. Even when these comments were made in dissents or at oral argument, they captured the lion’s share of media attention and commentary. Scalia used his seat on the court as a bully pulpit (literally), deploying his razor-sharp wit and targeted put-downs to draw doctrinal lines in the sand—most aggressively when he was not in the majority. In the months ahead, Scalia’s legacy is perhaps most relevant in terms of his own Senate confirmation process in 1986. 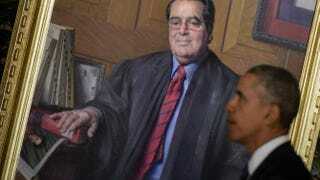 Then-Judge Scalia was already recognized as a conservative torchbearer who had promised to upend swaths of constitutional decisions, openly mocked affirmative action and boldly assailed what he termed an “imperial judiciary.” Nonetheless, Scalia was given a fair hearing before the Judiciary Committee and was overwhelmingly confirmed by the full Senate 98-0, in a prompt process that lasted 85 days. That sort of bipartisanship and efficiency harks back to an era of congressional cooperation to which we should aspire once more. Today, as the president rigorously vets a slate of potential nominees, their passion and unrelenting convictions are part of the full mix of judicial qualifications that he is entitled to review. Ultimately, the Supreme Court, which Scalia rightly revered, deserves nominees who are impassioned, brilliant, and equally able to dissent and to lead us onward. Sherrilyn A. Ifill is the president and director-counsel of the NAACP Legal Defense and Educational Fund. Follow her on Twitter.